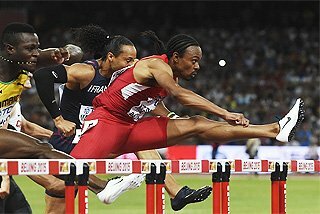 The third Samsung Diamond League season climaxed in Brussels with an outstanding 110m Hurdles World record of 12.80 from the US Olympic champion Aries Merritt but saw five athletes win their event’s Diamond Race for a third consecutive time. The quintet who laid claim to the distinction of perfect Diamond League records were France’s Olympic Pole Vault champion Renaud Lavillenie, Jamaica’s 400m hurdler Kaliese Spencer and three Kenyan athletes - 3000m steeplechasers Paul Kipsiele Koech and Milcah Chemos, and 5000m runner Vivian Cheruiyot. Jamaica's IAAF Athlete of the Year Usain Bolt was not among this select group. Although he has made a habit of winning global 100m and 200m titles in recent years, his Diamond Race victory in the 100m was his first since the landmark competition began. For the first time, the overall winners in their event – the Diamond Race winners – earned not just a Diamond Trophy and cheque for $40,000, but also a wild card entry to the IAAF World Championships in Moscow next summer. Kenya’s World champion and record holder David Rudisha also made a stunning impression on the series, winning the New York Diamond League in 1:41.74. Rudisha bettered that in Paris with 1:41.54, the seventh fastest time ever, despite damp and chilly conditions. Things were looking good for London 2012, and he delivered that spectacularly, but the Olympic champion with his newly established World record of 1:40.91 ended his season in Diamond League defeat. 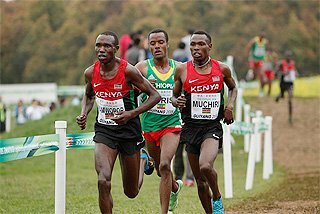 In the final 800m of this year's series at Zurich’s Letzigrund Stadium, and with double points on offer, the Kenyan was beaten by 18-year-old rising star Mohammad Aman, who claimed the Diamond Race prize in the process. Yuliya Zaripova’s 2012 world-leading performance in the women’s 3000m Steeplechase was one of three stadium records to fall at the 46th DN Galan meeting. On a night of celebration to mark the 100th anniversary of Stockholm’s historical venue, the Russian, one of six newly-minted Olympic champions who prevailed here as well, delivered the finest performance of the meeting, a 9:05.02 run that secured her the Diamond Trophy in her event. 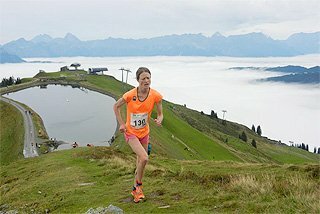 Despite her world record attempt coming slightly unstuck, without any help from pacemakers after the first kilometre, she still managed a personal best for second place on the world all-time list with the fastest time in the world since her compatriot Gulnara Galkina set the world record of 8:58.81 in 2008. By the bell, Tunisia's London silver medallist Habiba Ghribi was second but, just like at the Olympics, there was no catching Zaripova although Ghribi reached the line in 9:10.36, the second fastest time of her career. Another Olympic champion, Croatia's Sandra Perkovic, also earned her Diamond Trophy early as she produced two meeting records in the Discus, finishing with a best of 68.77m, her second best ever after the distance of 69.11m which had secured her the gold medal in London. New Zealand's Valerie Adams, who won the Shot Put gold medal in London, also left Sweden as a Diamond Race winner after producing four throws that beat the previous stadium record, the best of which was 20.26m. 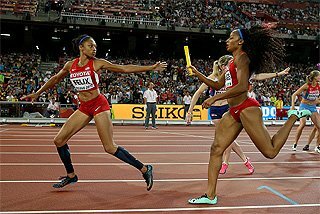 Of the other Olympic champions taking part in the Swedish capital, USA’s 400m winner Sanya Richards-Ross held off Botswana's World champion Amantle Montsho to won in 49.89. Russia’s High Jump champion Anna Chicherova produced a winning effort of 2.00m and USA's Christian Taylor required a distance of just 17.11m to win the Triple Jump. Ethiopia’s 18-year-old Mohammed Aman earned an 800m win over Olympic 1500m champion Taoufik Makhloufi, clocking 1:43.56, with the Algerian clocked a personal best of 1:43.71. Usain Bolt and his training partner Yohan Blake produced meeting records over 200m and 100m respectively on the famously swift surface of the Stade de la Pontaise at the Athletissima meeting. Bolt ran 19.58 to better his own meeting mark set three years before. Behind him, European champion Churandy Martina lowered his Dutch record from 19.94 to 19.85. Blake recorded 9.69 in a 100m that was not an official Diamond League scoring event that night and moved to equal-second, alongside Tyson Gay, on the world’s all-time list. Gay finished second in the Swiss city with 9.83 with Jamaica's Nesta Carter equalling his season's best with 9.95. The men’s High Jump was another great contest. Qatar's Olympic bronze medallist Mutaz Essa Barshim not only bettered the 1994 meeting record of 2.37m that had belonging to Javier Sotomayor but also matched Ivan Ukhov's 2012 world-leading mark when he went over 2.39m. Barshim also beat Russia's Olympic champion Ivan Ukhov, who cleared 2.37m, as did third-placed Robbie Grabarz, a joint Olympic bronze medallist with Barshim, who equalled the British record with his performance. Kenya’s Pamela Jelimo pumped her arms into the air to celebrate an 800m win over Mariya Savinova, her successor as Olympic champion, in 1:57.59. World champion Jason Richardson won the 110m Hurdles in 13.08 as his American compatriot and Olympic champion Aries Merritt, hoping to set a World record, was disqualified for false-starting. In what was a virtual dead heat, a scintillating finish from Carmelita Jeter saw the American take a thrilling 100m victory ahead of Shelly-Ann Fraser Pryce, who had beaten her to the Olympic gold medal, with both women credited with 10.86. 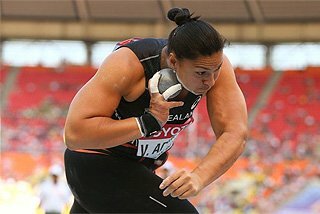 Olympic champion Valerie Adams only needed her first attempt of 20.73m to set a new Shot Put stadium record but improved with her final effort to 20.95m to keep her 2012 unbeaten record alive. The Aviva Birmingham Grand Prix saw another 100m victory by World champion Carmelita Jeter over Olympic champion Shelly-Ann Fraser-Pryce, and another run under 13 seconds by Olympic 110m Hurdles champion Aries Merritt. Jeter’s 10.81 clocking in the Alexander Stadium was a meeting record, as was the 12.95 recorded by Merritt – into a 0.9mps headwind – in a race where his US colleague Jason Richardson equalled his lifetime best of 12.98. "I made a lot of technical mistakes, I floated a lot of hurdles," said Merritt. "Hopefully, next time I won’t make those mistakes and run a clearer race; then, who knows? Initially disqualified but then reinstated, Jamaica's Kaliese Spencer ran strongly to clock 53.78 in the 400m Hurdles with Britain’s Perri Shakes-Drayton second in 54.08, just 0.06 ahead of Czech Republic's Olympic bronze medallist Zuzana Hejnova. Russia’s Olympic champion, Natalya Antyukh, held a slight lead at the halfway mark but then started to fade, eventually crossing the line fourth with 54.95. Kenya's Mercy Cherono made up for missing the Olympics with a thrilling victory over her compatriot Vivian Cheruiyot in the women’s 3000m, winning by a 0.01 in 8:40.21. After running such a tactically astute 800m in Lausanne, Kenya’s Pamela Jelimo allowed herself to get boxed in when the serious racing started and she could only watch as the Olympic champion Mariya Savinova raced away to win in 2:00.40. Usain Bolt’s 19.66 meeting record in the 200m and 18-year-old Mohammed Aman’s shock 800m win over Olympic and World champion David Rudisha provided the highlights of the famous Weltklasse meeting which formed the first of the two 2012 Samsung Diamond League finals. A total of 15 Diamond Race, and the $40,000 prize that accompanies them, were awarded - with the men’s and women’s Shot Put winners being the first to secure their prizes having competed the day before - in front of a sell-out crowd of 26,000 who packed Letzigrund Stadium despite steady rain and unseasonably cool temperatures. By the time Bolt was adjusting his blocks for the 200m, the downpour had finally relented but the temperatures had dipped to a chilly 14 degrees. However, the cold didn’t seem to affect the double Olympic champion, nor his compatriot Nickel Ashmeade, who pushed, and even threatened Bolt for two-thirds of the contest. The pair were almost even off the curve and into the stretch, until Bolt finally pulled away and beat the 19.79 meeting record set by US sprinter Wallace Spearmon two years ago. However, Ashmeade’s 19.85 personal best secured him with the overall Diamond Race victory. Rudisha’s victor had a familiar face: it had been the Ethiopian teenager Aman who had ended the Kenyan’s winning streak at 26 just under a year earlier in Milan. Running in similarly rainy conditions to that race in Italy, Aman’s stunned the new Olympic champion as he ran a 1:42.53 national record. 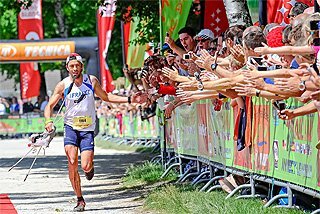 As he crossed the line, the collective shock expressed by the crowd was palpable. The two entered the straight almost together, beginning a stride-for-stride battle until Aman, this year’s World Indoor champion, just edged ahead with 40 metres to go. "I am incredibly thankful to win in front of this audience with a new PB and national record," said Aman, whose previous best of 1:43.20 came in the Olympic final where he finished sixth. "It was a difficult race but I was in good shape." With his victory here, Aman also lifted the Diamond Race trophy, totalling 14 points to Rudisha’s 12. Olympic 100m champion Shelly-Ann Fraser-Pryce, beaten twice by World champion Carmelita Jeter in Diamond League races in the wake of the London 2012 Games, ended the latter’s two-year reign as Diamond Race winner and took full advantage of the fact that the climactic meeting offered double points. 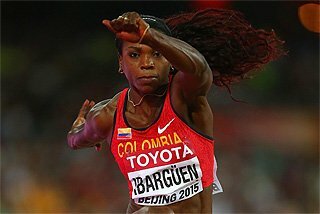 Her winning time of 10.83 was 0.14 ahead of the American and put her six points ahead in the overall standings. In the men’s 100m, not on the Diamond Race schedule in Zurich, victory went to Bolt’s training partner Yohan Blake in 9.76. "I’m not surprised that after the Olympics I’m coming out so strong and so fast," said the double Olympic silver medallist Blake, who sliced 0.01 from the meeting record set by fellow Jamaican Asafa Powell in 2006. "Next year I can even be better," he warned. It was always a long shot for Sanya Richards-Ross to win the 400m Diamond Race but the Olympic champion did end her season with a convincing victory over Amantle Montsho, 50.21 to 50.33, pulling away over the final five strides. Montsho’s runner-up finish gave her 20 points in the series, four more than Richards-Ross. Puerto Rico's 400m Hurdles silver medallist Javier Culson only managed fifth place on the night but he had an insurmountable points lead arriving in Zurich. The final race was won by United States' Angelo Taylor in 48.29. Dawn Harper, also an Olympic silver medallist, secured the Diamond Race in the 100m Hurdles with a final victory in 12.59 to take her points tally to 16, four ahead of Olympic bronze medallist Kellie Wells, who was third here in 12.69. An embarrassing lapse in concentration cost Sofia Assefa victory in the 3000m Steeplechase, not to mention the US$40,000 prize and Diamond Trophy that would have gone with it. 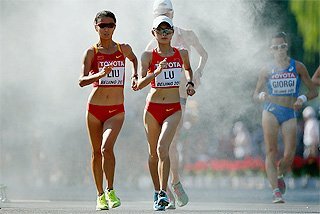 The 24-year-old Ethiopian initially finished first in 9:21.32, which would have been enough to win her the overall prize for the series, but her celebrations were short-lived as she was soon disqualified for running inside the cones coming into the water jump for the final time. Her compatriot Etenesh Diro Neda took the win in 9:24.97. Although she finished well down in ninth, after suffering a fall over a hurdle, Kenya’s Milcah Chemos lifted the Diamond Race trophy for the third consecutive year with 12 points. 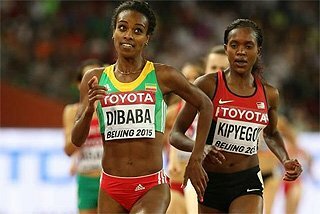 There was no stopping Abeba Aregawi in the 1500m as the 22-year-old Ethiopian ended her breakthrough season with a Diamond Race victory in the event. At the end of a tactical contest, she was the picture of calm when she crossed the line in 4:05.29, more than a second clear of Kenya's Mercy Cherono who was the runner up in 4:06.42. The men's 5000m Diamond Race was largely up for grabs, and Isiah Koech took full advantage of the situation. The 18-year-old, who finished fifth in the Olympic Games, out-sprinted several more experienced rivals to take the victory in 12:58.98 and clinch the title with 17 points. Kenya's Olympic bronze medallist over the distance, Thomas Longosiwa, and 13 years Koech's senior, was second in 12:59.24 while Bernard Lagat, fourth in London and at 37 more than twice Koech’s age, finished third in a season’s best of 12:59.92. Yelena Sokolova’s victory in the Long Jump with 6.92m gave the Russian 22 points, which were enough to take the Diamond Race. In the men’s High Jump, which began in the early evening’s long steady rain, Russia's Olympic champion Ivan Ukhov won with 2.31m, but the Diamond Race went to Britain’s Robbie Grabarz who was second with 2.28m and totalled 17 points. In the Javelin Throw, Finland's former World champion Tero Pitkamaki made it two Diamond League victories in a row courtesy of an 85.27m final round throw to defeat compatriot and Olympic bronze medallist Antti Ruuskanen, who had reached 83.36m in round four. However, Czech Republic’s European champion Vitezslav Vesely earned the Diamond Race victory in the Javelin Throw, despite finishing fourth with 80.54m. In terms of the Diamond Trophy chase, there was little suspense in the first three events on the rainy programme with Olympic champions Sandra Perkovic, Renaud Lavillenie and Christian Taylor having clinched the series titles in the women’s Discus Throw, Pole Vault and Triple Jump, respectively, before their arrival in Zurich. Perkovic produced a win with an effort of 63.97m, and Lavillenie was also victorious with a modest 5.70m clearance. However, Italy’s Olympic bronze medallist Fabrizio Donato rained on Taylor’s parade and won with 17.29m. Competing the day before the main meeting, and in front of an energized crowd at Zurich’s main train station, Valerie Adams and Reese Hoffa won their respective Shot Put competitions with 21.64m and 20.81m, the latter a meeting record. Both thus confirmed their overall victory in the Diamond Race. Olympic 110m Hurdles champion Aries Merritt finally put it all together in the final Samsung Diamond League meeting of the season to take 0.07 off the World record at the Memorial van Damme meeting, lowering the mark to 12.80. Running before a capacity crowd of 47,000 at the King Baudouin Stadium, Merritt obliterated the previous World record of 12.87 set by Cuba's Dayron Robles in Ostrava in 2008. 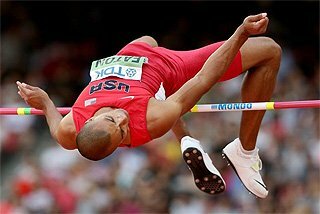 The last time a high hurdles World record had been broken by such a margin was in 1981 when Renaldo Nehemiah clocked 12.93 in Zurich to lower his own mark by 0.07. After a series of performances in the 12.90s this season, it seemed just a matter of time before Merritt would eclipse Robles’ mark and it was clear that this was to be the night before the race even reached 60 metres. Fast from the gun, Merritt had already pieced together a sizeable lead by the third barrier which was then extended over the next four. He initially appeared to stop the clock at 12.81 before his time was adjusted down. "It was a shock when I saw the time pop up on the scoreboard," said Merritt, whose previous personal best was 12.92. "That was better than I ever could have expected. And later it was even corrected to 12.80. Unbelievable." With his victory, Merritt also claimed the Diamond Race trophy in the event with 18 points. World champion Jason Richardson also had 18 points, but lost out because he won only two races to his fellow American’s three. The American was one of 15 athletes who ended the evening at least $40,000 richer and with a Diamond Race trophy in their hands. 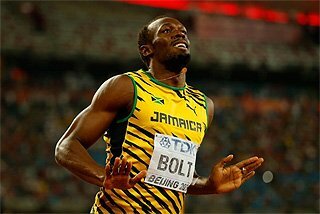 Another was Usain Bolt in the 100m, his first since the inception of the series in 2010, and a victory in 9.86 was sufficient. Local hero Kevin Borlee delighted home spectators as he secured the Diamond Race with a 400m victory in 44.75, coming home ahead of his twin brother Jonathan, whose strong finish helped push Dominican Republic's Olympic silver medallist Luguelin Santos into fourth and out of the points. There was a tie between Kevin Borlee and Santos, with both men having 10 points, and each had collected one victory on the Samsung Diamond League circuit, but the Diamond Race went to the Belgian with his better performance in the final. US sprinter Charonda Williams finished third in the 200m behind Ivory Coast winner Myriam Soumare, who clocked 22.63, but that was enough for the American to claim the Diamond Race with 12 points. Second place in the 800m behind Burundi teenager Francine Niyonsaba, who won in a national record 1:56.59, was enough to secure overall victory for Kenya’s 2008 Olympic champion Pamela Jelimo. Kenya's Silas Kiplagat won the 1500m Diamond Race after taking the final in 3:31.98, finishing 0.12 ahead of Ethiopia’s Mekonnen Gebremehdin. 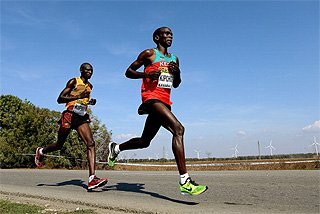 Kiplagat's total rose to 16 points and he finished two ahead of fellow Kenyan Asbel Kiprop who, after missing two weeks of training, could only finish fifth in the Belgian capital. Another Kenyan win went to Vivian Cheruiyot, who powered away from the 5000m field over the final 300 metres to take the race on the track and the Diamond Race. The 2012 Olympic 5000m silver and 10,000m bronze medallist clocked 14:46.01 with her compatriot Mercy Cherono second in 14:47.18. Cheruiyot finished with 18 points in the Diamond Race, two more than Cherono. Kenya's Paul Kipsiele Koech started the 3000m Steeplechase holding an insurmountable 11-point lead, so there was no drama in the Diamond Race for this particular event, but there was a point to prove for another Kenyan, the 2008 Olympic champion Brimin Kipruto, who fell in the London final in the defence of his title the previous month and finished a distant fifth. Here, Kipruto ran cleanly en-route to an 8:03.11 victory, comfortably ahead of his impressive 17-year-old namesake Conseslus Kipruto, the reigning World youth and junior champion, who clocked 8:03.49, while Koech was third in 8:04.01. With a nine-point lead, Kaliese Spencer’s victory in the 400m Hurdles Diamond Race was a given, but the Jamaican underscored her season-long consistent form with a strong 53.69 victory despite a badly taken final hurdle. Britain’s Perri Shakes-Drayton was almost able to take advantage but finished second in 53.89. The first result on the infield came in the men’s Discus Throw when Estonia's 2008 Olympic champion Gerd Kanter, this year’s Olympic bronze medallist, claimed his first Diamond Race trophy after winning with a 66.84m effort in the third round. "For two years I was close but I didn’t have a good final," said Kanter. "But today I had my best performance in a 2012 Diamond League meeting." Russian long jumper Aleksandr Menkov rode his late season form all the way to the Diamond Race title and won with a personal best of 8.29m here. One of the closest battles in a women’s Diamond Race came in the Pole Vault where, in the end, just two points separated Germany's overall winner Silke Spiegelburg from Brazil's 2011 World champion Fabiana Murer. On the night, Spiegelburg managed 4.75m with Murer only going over 4.65m. US high jumper Chaunte Lowe, whose Diamond Race victory was already secure, bowed out at 1.92m in a competition which Russia's Olympic bronze medallist Svetlana Shkolina won with 2.00m. Kazakhstan's 2012 Olympic champion Olga Rypakova dominated the women’s Triple Jump, reaching 14.72m to take a decisive victory, and with it the Diamond Race with 24 points. Another Olympic champion, Czech Republic's Barbora Spotakova, added eight points to her already unassailable lead in the Javelin Throw with a 66.91m victory. Away from the Diamond League programme, Yohan Blake returned to the track where he had produced his 19.26 breakthrough a year earlier and won in 19.54, while the 10000m was won by Kenya's Emmanuel Bett, who had finished fourth in the Kenyan trials but here produced a 2012 world-leading time of 26:51.16.